Getting a tune stuck in your head and not being able to identify it, or hearing song but not knowing what the name is, if I were you, I cannot sleep if something like that happens. Though it is a kidding for wakefulness, we have pulled together a handy list of resources that can help you out of such musical dilemmas. How to identify music? Just keep reading. After identifying your desired music, if you are still looking for a tool that can help you to download desired music, try Free HD Video Converter Factory. 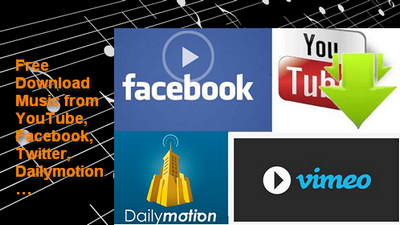 Just copy & paste can download music from YouTube, Facebook, Twitter, Dailymotion, etc. video-sharing sites. Try this software now! Fantastic Approaches to Identify Music on PC. After a number of tests and extensive search, we recommend the following music identifier online to help you identify music on PC. 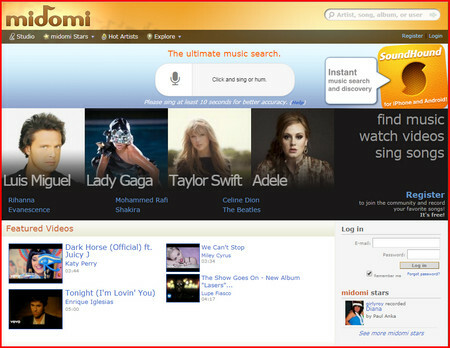 Midomi.com is a music search engine website that can search for the music you want by voice. You can find song by humming, singing or just whistling. Moreover, it can connect to the community that is the same as your music orientation. Its accuracy is very high, you can try it yourself, trust me, it is really amazing! How to Identify a Song via midomi.com? 1. Connect the Microphone to your computer and then visit midomi.com. 2. Click the "Click and sing or hum" button to start humming or whistling. You’d better sing at least 10 seconds for more accurate search results. 3. Click “Click to search” to start the search. That’s the whole steps to identify song by humming. Midomi offers a smart service that is just perfect for those tune-stuck-in-your-head moments. It will help you get out of that annoying trance when you're indefinitely humming unknown tunes. 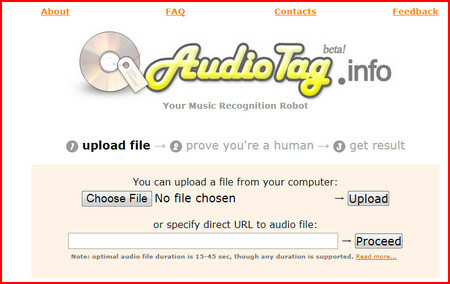 Audiotag.info is a free music-recognition service. You can record or cut an audio sample and upload it to this website. 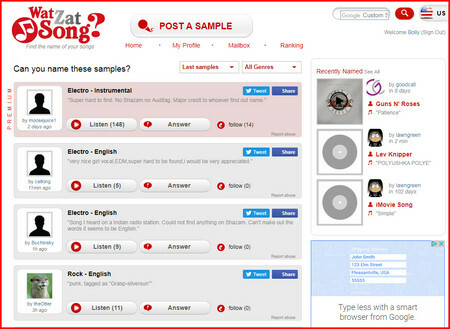 Then AudioTag can help you analyze and match the most similar songs in the music library. How to identify a song via Audiotag.info? 1. Upload audio sample or directly specify direct URL to audio file. 2. Prove you're a human, calculate and enter the result in the box. 3. Click the Next button to start recognizing. You can upload your files in almost any file format and with any bit-rate. Uncompressed, ADPCM and other waves (.WAV), MPEG-1 Layer III (.MP3), Ogg Vorbis (.OGG), FLAC, Flash Video (.FLV), .AMR, .MP4, and many more file formats are supported. It even allows you to identify almost any unknown piece of music quickly and easily. Watzatsong.com is another great website to identify songs. Differed from the two websites above, it identifies the track with the help of others. How to Identify a Song via Watzatsong.com? 1. Register an account and activate it. 2. Click the “POST A SAMPLE” button to record, hum song or upload audio sample. 3. Waiting for others to listen and give the answer. Compared to the two methods above, you cannot get the answer right away but it increases your chances of interacting with others. Show that you are the best at music quizzes by naming other one's songs! With all the three methods mentioned above, I believe you can identify song by humming, sound or other people. Hope you enjoy your desired music freely. If this article does help you, feel free to share it with more people. 100% free, safe and clean without any pop up ads, misleading ads, or spyware and bundles. 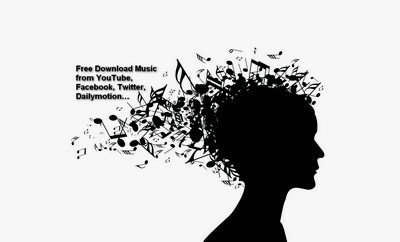 Just copy & paste can download music from YouTube, Facebook, Twitter, Dailymotion, etc. video-sharing sites.